I don't know how old I was when I started having a fascination for wild foods, but I can point to a few family activities that caused it. As far back as I remember we used to go pick apples every year at an orchard near Stone Ridge, New York. Always fun, except of course for the inevitable case of poison ivy that followed a few days later. The apples weren't wild, but still the idea of picking something from a tree, and eating it right there got to me. Another major influence were the wild strawberries and blueberries we picked as kids. The strawberries grew near our home in Woodstock. There were several places where you could pick a dozen or two small wild strawberries quickly with little effort, but a short bike ride away was a meadow that my older brothers Lee and Paul called Sergeant's Field. You could pick a few quarts of the local delicacy there. The blueberries came from Ice Caves Mountain, near Ellenville in the Shawangunk Mountains. Ice Caves used to be a privately-owned mountain top tourist-trap, but has since become a forest preserve, similar to other Shawangunk Mountain preserves Mohonk, and Minnewaska. Huge blueberry bushes were there. Or, at least they seemed that way to a little kid. Even though I picked the berries with the rest of the family, I never really developed a love for them. I will eat them in muffins and pancakes, but rarely just plain. Still, I was amazed that something that everyone craved came from the wild, and not a store. It was then that I started to notice the foliage around our house. We had both woods, and a lawn, and something in-between. Wild blueberries, black raspberries, rose hips, beech nuts, wintergreen, wild carrot, spearmint, chives, milkweed, these were some of the plants that I learned to recognize with some help from my mother. When I was 16 I think, I was away at scout camp one summer and decided to take a wilderness survival course. We learned many of the plants that I already recognized and a few more. solomon's seal, arrowhead, and groundnut to name a few. We lived for two days on wild plants, hand-caught trout, and frogs legs. 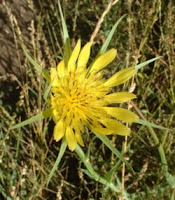 From that point on, any time I saw a wild plant I didn't recognize, I had to know what it was, and what it was used for, if anything. Even the inedible ones fascinate me sometimes. So, let's get seasonal! First though, a disclaimer: I don't recommend eating anything without checking a good field-guide, or other reliable resource. A good book for beginners is Peterson's Guide to Edible Wild Plants. Also, the Euell Gibbons books are a good read, but a little dated. Be smart! Start with the easiest to identify. With mushrooms for example, the easiest to start with are varieties that can almost never be mistaken for anything else, like puffballs, chicken mushrooms, or morels. 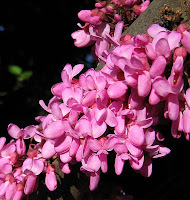 Read about dangerous plants in the guide, and learn to recognize them. Also, plants that grow near toxins, tend to absorb them. Try to pick well away from busy roads, and other areas where the hustle and bustle of our day to day lives has had a negative effect on the soil, groundwater, and air. This time of year, foraging is still possible. Mostly though, finding wild edibles in the winter depends on knowing where the remaining dead stalks of the plants from the fall are. 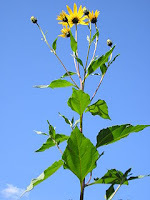 Jerusalem Artichoke is a good example, as many of us will recognize the plant from the picture here, and know where some dried up stalks are this time of year. Looking in the late summer, early fall, like a small headed sunflower, the Jerusalem Artichoke actually has nothing at all to do with Jerusalem. The name Jerusalem is believed to be a corruption of the word Girasole, which is the Italian word for sunflower, and although it is in the same general plant family as the Artichoke, it isn't anything like it. 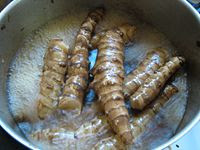 What is eaten on the Jerusalem Artichoke is the underground tuber. Looking like a long, thin, irregular potato, they can be eaten raw or cooked. If you want a good look at the commercial variety for identification, look for them in the supermarket where they may also be referred to as Sun Chokes. Raw, they can be sliced into salads. They have a crunchy texture, and nutty flavor, similar to a water chestnut. Cooked, they can be used like potatoes, either sliced thin and fried like potato chips, or peeled, and roasted whole like a potato. They don't take well to mashing though, as they end up with a lumpy, watery texture. Also, Jerusalem Artichokes contain a starch known as Inulin. Inulin is not digested like ordinary starch by most people, making it a good choice for people who have trouble with carbohydrates. My only warning about these tubers is to resist the temptation to bring them home and plant them in your own garden. They will take over rapidly, and are almost impossible to eradicate once they do. Maybe that's another source of the name artichoke, since they tend to choke-off any other plants they compete with. Female sheep (ewes) usually have one or two baby lambs at a time. Sometimes however they are known to have more. Usually the extra ones do not get taken care of. Natural selection will find the smallest lamb being abandoned by its mother. 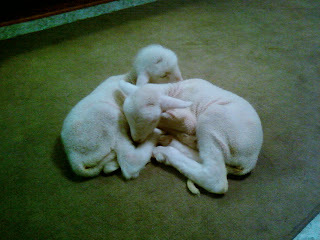 So, sheep farms will raise these orphans themselves by bottle feeding them, hence they are referred to as bottle lambs. Marti was offered a chance to be a foster mom to a pair of abandoned lambs last Thursday. She bottle feeds them every four hours, and keeps them entertained and clean. I have to say, its not an activity for just anyone. Its a lot of work! These two will be with her for two weeks. I couldn't help though as I got to the house Friday night, recalling the line from Star Trek Four, when Scotty successfully beams the whales into the ship, Captain... There be whales here!! Strange, yes... but overwhelmingly cute! M a a a a a a a a a !! As for me, I am still working for AOL in Manhattan. 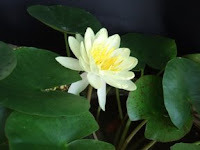 I will try to post a bit more now, and there is always something to write about. Same thing with my freeware blog (link on the sidebar). Bye for now. See y'all soon!